January showed the most progress to date, but that is deceiving. It’s been said that the construction of the hull itself is one-third the total project. We haven’t actually finished the hull at this point, so we’re not at the 1/3 stage yet! But the owners are thrilled and that’s what this is all about. The skeg needs to be fabricated, installed and shaped. The outer stem has to be laminated in situ and bolted to it’s inner counterpart. This catboat has a very deep skeg that fits well in Penobscot Bay, and adds a measure of stability and sailing quality that I prefer in a catboat. 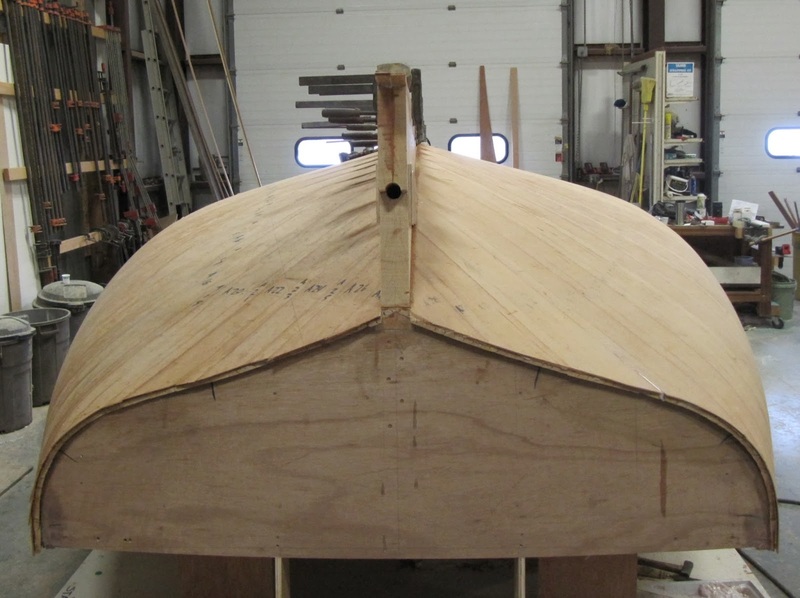 As in any boat building project, nothing happens without a dozen preparatory steps. Seth has taken the dimensions off the drawings but we want to be sure it looks right. These photos take us to the end of February, which is surprising given the fact that the hull was built in less than a month! The labor involved in fairing before wetting out the cloth is time-and-material-consuming. Putty is spread on, and then sanded off. Repeat the process again and again. The hull has to be perfectly fair before we sheath it in cloth.